Morclean are proud to have won The Green World Ambassador Award 2015; we were given the opportunity to put ourselves forward after winning The Green Apple Award 2014. Having been presented with this award as Green World Ambassador 2015, we are able to represent ourselves and our country in this global initiative. The award was presented to Managing Director Peter Morely at a carbon-neutral presentation ceremony at the Empire Casino, Leicester Square, London on Monday, June 29, 2015. Following the presentation our Green Paper is now published on The Green Book CD (distributed all over the UK and around the world). The Green Apple Awards are one of the world’s most prestigious recognised campaigns and to mark their 20th successful year they launched the Green World awards. This year’s Green World Awards ceremony will be in New Zealand where the overall winner will be presented with the world award. The Green World Awards recognises and rewards Governments, Ministries, departments, Agencies, Authorities and individuals who have a beneficial impact on the environment and improve sustainability. The Green Organisation has been established since 1994 as an international, independent, non-profit, non political, non-activist environment group, dedicated to recognising, rewarding and promoting environmental best practice around the world. By publicising these examples, they hope that others will learn from the winners experience and follow their lead to benefit themselves and the environment for generations to come. On 10th November 2014 Morclean collected a national environmental award for their Binwash City, from the Houses of Parliament. Morclean scooped the prestigious Green Apple Award for Environmental Best Practice at a ceremony at the Houses of Parliament in London, for their battery operated wheelie bin-cleaning machine. Morclean launched the first Wheelie Bin Cleaning Machine as a petrol version in late 2012; due to the popularity of the first range of machines, Morclean have been developing a brand new, innovative battery operated bin-cleaning machine since. The City battery machine is a totally new idea in the bin cleaning industry and takes huge steps forward to improve what is currently available. With worldwide emphases on green and eco-friendly products, the Binwash City offers a sustainable, eco-friendly alternative to those conscious about their carbon footprint. Morclean Director, Peter Morley, said "We wanted to develop and launch a product that the environmentally minded love, a concept that operators want to be part of, a machine that turns heads and offers more than just necessity and compliance." The Binwash City is a battery operated wheelie bin wash cleaning machine, capable of cleaning two bins at any one time. It takes all the hassle out of bin cleaning, as this handy machine fits onto a tow bar and can be towed by most vehicles. It also lifts the bins for you with its hydraulic lift system, meaning all you do is hook the bin on and clean it with the high-pressure hose attached. The bin cleaning machines make the perfect start up business package with no franchise, and the opportunity to earn up to £160,000 per year from just one machine. Peter went on to say, "The aim was to develop a smarter product that moves into a new direction as opposed to re-working the systems currently available. "The new CITY was developed so that Morclean could provide a totally new concept, which we feel is an extremely innovative and product that will reduce fuel, costs and C02 emission. "We consider that this is an even better solution for the whole industry than what was previously available in the market place - both from ourselves and our competitors." Like many bin wash machines on the market today, recycling water and saving energy was a requirement rather than an innovation. Morclean felt that machines were making savings for reasons of necessity, legislation and profit as opposed to being totally innovative. So, they tried to excel and improve the machines totally powered from batteries instead of an engine. 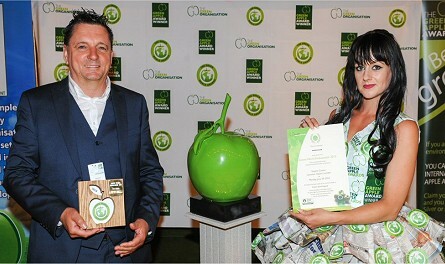 Morclean would like to thank the Green Apple Awards for their recognition in what is a niche market sector. The awards were well attended and a great night was had by all; we hope the Binwash City is as well received as our original, petrol driven Bin Wash machine. We competed against more than 500 other nominations in the Green Apple Awards for Environmental Best Practice and will be presented with a trophy and certificate at a glittering presentation ceremony in The Houses of Parliament on 10th November 2014, presented by Miss UK Green Queen. As a result of this Green Apple Award success, we have been invited to have our winning paper published in The Green Book, the world's only annual work of reference on environmental best practice that is distributed free of charge all over the UK and around the world through embassies, environment professionals, central and regional government, universities, reference libraries and the media. This achievement provides the potential to represent the UK in the European Business Awards for the Environment... Watch this space! The Green Apple Awards began in 1994 and have become established as the country's major recognition for environmental endeavour among companies, councils, communities and countries. The awards are organised by The Green Organisation, an independent, non-political, non-activist, non-profit environment group dedicated to recognising, rewarding and promoting environmental best practice around the world. The Green Apple Awards are supported by the Environment Agency, the Chartered Institute of Environmental Health, the Chartered Institution for Waste Management and other independent bodies.